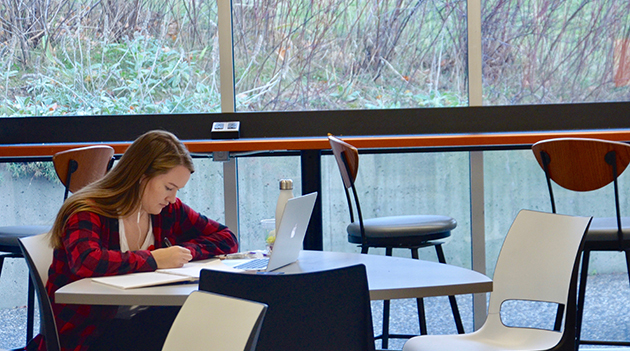 Emma Rose (seen here studying in the UFV cafeteria) was one of five students to receive Ike Barber transfer scholarships. She transferred to UBC to pursue an engineering degree. Five former UFV students who have transferred to continue their education have received Ike Barber Transfer Scholarships worth $5,000 each to assist them in moving between BC post-secondary institutions. Caleb Keillor of Abbotsford (who transferred to Simon Fraser University), and Jake Letkeman and Garrett Offereins (both of Abbotsford), Emma Rose of Chilliwack, and Brent Mueller of Langley (all of whom transferred to the University of British Columbia), received the scholarship. All five transferred in order to enrol in engineering programs after taking an initial one or two years of engineering studies at UFV. The scholarships are awarded annually by the Irving K Barber BC Scholarship Society to undergraduate students who have completed at least one year at a public post-secondary institution in BC and are transferring to another degree-granting institution to complete their studies. Scholarship funds come from the returns on a $15-million endowment established by the province in 2006. The fund is named after philanthropist Irving K Barber, who had a long history of supporting public education and research projects in British Columbia before his death in 2012. To qualify for a transfer scholarship, students must have strong grades and demonstrated volunteer service to their school and/or community. The Irving K. Barber BC Scholarship Society offers scholarship and education award programs that support BC students attending public post-secondary institutions. The Society recently announced expanded scholarship and award programs for Indigenous students, and for women studying technology. Since 2006, the Society has awarded over $16 million in scholarships to thousands of BC students.